It was February 2006 when I played through the first episode of the Delaware St. John series. The episode was called The Curse of Midnight Manor. In the game, you assumed the role of private investigator Delaware St. John. Delaware specialized in investigating paranormal events and bringing rest to troubled spirits. His partner, Kelly Bradford, provided Delaware assistance every step of the way. The episode took place in an abandoned hotel called Midnight Manor. Players were tasked with uncovering the mysteries of the hotel and helping the ghosts roaming its corridors find some peace. I was immediately captivated by the game's story and atmosphere. Delaware and Kelly made for highly likeable protagonists. The interaction between the two characters was delightful. The game also made excellent use of Delaware's unique abilities. Sure, the game did not boast cutting-edge graphics. 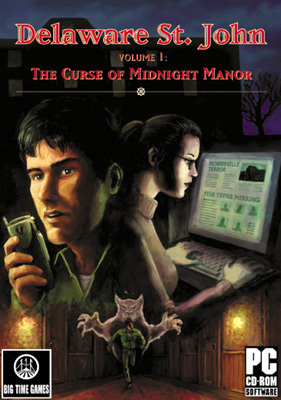 However, it was clear from the start that The Curse of Midnight Manor was a labor of love. What the game lacked in technology, it made up for in heart. 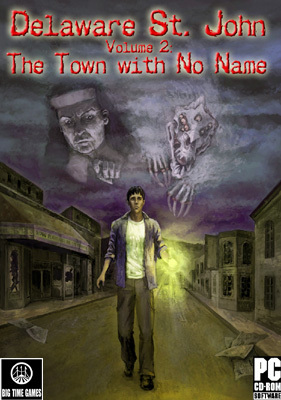 The second episode, called The Town with No Name, was already available by the time I completed The Curse of Midnight Manor. It offered gamers a similarly enjoyable experience. 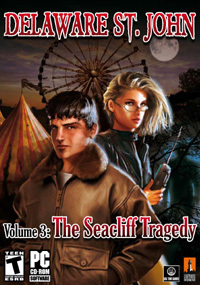 The third chapter of the series, called The Seacliff Tragedy, was released in 2007. As Wendy Nellius put it in her review, besides providing another engaging adventure-gaming experience, episode three "had a doozy of a twist at the end." Wendy concluded her article saying "I can’t wait for the next one to come out so I can find out what happens next." Five years later, we might finally have a chance to see the next chapter of the story. The fourth episode of Delaware St. John has been delayed due to a lack of funding. As such, under the leadership of Bryan Wiegele, the development team is asking the adventure gaming community for their assistance in financing the project. Mr. Wiegele has started a Kickstarter project to fund the development of episode four. As backers started to pledge their donations, Mr. Wiegele kindly agreed to answer a few questions and describe what he has in mind for episode four. [Adventure Lantern]: Nearly five years have passed since the release of Delaware St. John Episode 3: The Seacliff Tragedy. Can you tell us a little bit about the projects you worked on in the intervening time? [Bryan Wiegele]:The last five years have been pretty busy. I oversaw the development of a game for Playstation 2 and another for Playstation 3. I also created a social party game for Xbox 360. Last fall I worked on a new horror series called Relics. Currently I’m wrapping up work on an iOS game. [AL]: What were some of the reasons for the delay between the release of the third episode and starting work on the fourth chapter? [BW]:There really is only one reason for the delay; money. Without funding to make projects happen, they just kinda sit on the back burner until an opportunity presents itself. And you just never know how long it’ll be before that opportunity comes or even if it will. [AL]: What were some of the challenges you faced as you developed the first three episodes of the series? [BW]:I’ve been very fortunate to be able to work with very talented people who were able to accomplish a lot with very little. With the first three games our biggest challenge was trying to create a quality game experience without the luxury of time or money. Our initial thought was if we can get a series going and show people we’re committed, we’d pick fans up along the way and be able to increase our production values. As with life though, things just didn’t work that way. We were able to increase our production values in small steps with each game but we still weren’t able to get out from under the 'low budget' blanket. [AL]: How do you think the Kickstarter project can help overcome these challenges? [BW]:With a real budget we would be able to commit our efforts to this single project and have resources previously unavailable to us. This budget also covers a year of development time where previous games had to be done in six months. All of this means we will be able to refine the gameplay and polish the features to present the high-quality experience we’ve had the goal for all along. But before we even get that far, what I’m most expecting Kickstarter to help with is finally answer a question: How many fans of the Delaware St. John series are actually out there? The games have been sold literally around the world and translated into four additional languages. But at the end of the day I’ve no way to gauge the series’ impact. Through this experiment I’ll finally be able to get that answer and it’ll be one of two outcomes; either we have the fans who want the series to continue or we don’t. I sure hope we do but if we don’t, well, it’ll be closure and I’ll know I can just put this series to bed and move on to other things. [AL]: What are your overall goals for the next chapter in Delaware's adventure? [BW]:I consider the fourth game to be a turning point in the series. With the third game we did go a bit darker but four is intended to cross the line and take it from “creepy” to “frightening”, a bit more towards horror than the previous games. Additionally I want this game to include all of the things we had to cut in previous games. With this new game engine we won’t be limited in puzzle designs. With the additional time we won’t be cutting back stories down. And with a solid budget our animated sequences will be polished and more detailed. [AL]: How much funding is needed to meet your goals? Can you briefly describe how the funding will be allocated? [BW]:We need just over $280,000. This money will cover the cost of six team members plus about nine voice actors for twelve months of development time. [AL]: If the Kickstarter effort is successful, how will the scope of the fourth episode differ from the previous chapters? [BW]:The most exciting thing about this answer is despite the answer being a lot is changing, at the end of the day the player isn’t really going to notice from how they interact with it. The kinds of changes we’ve got planned are all taking advantage of a great 3D engine. Probably the biggest, most notable change will be in how the player navigates and explores. Thanks to the real-time 3D environment the player will be able to look around in full 360 degree motions. Additionally, environments will have ambient animations and support characters in the scenes. A wider variety of puzzles and more in-depth stories to the characters will also be a part of that larger scope. [AL]: When are you planning to release episode four? [BW]:If we raise the money, it’ll be wrapped for release in June, 2013. [AL]: Are there any story details you can share at this point? [BW]:The story opens a few weeks after the events at Seacliff Amusement. Delaware and Kelly have had a falling out and Delaware has been consumed by depression. He even chooses to ignore his latest visions but Kelly can’t. After he tells her of his vision of a hospital she can’t help but feel responsible and finds the location herself. Delaware goes after her and they spend the game trying to find each other in this huge old building. But before they’ll reunite they’re going to cross some very devious characters. [AL]: What kind of a setting can players expect to explore? [BW]:I don’t want to give away too much but a large part of the game will take place in the past so we’ve got both the modern day, dilapidated dark hospital as well as a version that was in-use and fully staffed. It’s actually really exciting since Delaware is tossed between these two versions of reality against his will. [AL]: What can you tell us about the overall style of the game? Can we expect a similar interface to what we saw in episode 3? [BW]:The style is 100% the same as the previous games but with the additional features I mentioned before. It’s a classic point and click interface that previous fans of the series will instantly recognize and understand. However, this time the features on the tool bar such as taking photos and recording sounds will play a more pivotal role. [AL]: Will the voice acting cast from the previous games return? [BW]:Yes. We’ve gotten all of the original cast members back on board and ready to go! Phil Quinn as Delaware St. John, Sonnet Quinn as Kelly Bradford, and David Vardy as Simon Foss. It just wouldn’t be the same without the original actors, right? [AL]: How can Delaware fans support the project? What is the deadline for contributing to the project? [BW]: They can visit our Kickstarter page here. They just have to click the Back This Project button and pledge the amount they wish to contribute. It’s absolutely no risk to them. They are only charged if the project gets funded. [AL]: Are there any incentives for individuals that make contributions to the campaign? [BW]:Yes, first you will have our thanks and gratitude. We realize it’s difficult to ask people to put money towards the future so we’re grateful for every contribution we get. Of course there are physical rewards as well. There is a list of incentives on the Kickstarter donation page. $15 or more gets the contributor a free digital copy of the game when it’s released. A $50 donation gets them a digitally re-mastered copy of each of the original three games plus a special edition collector’s version of the game on CD! We’ve been listening to what people have been saying and we’ve updated our rewards accordingly. We’d love for this to be a success and hope we can find enough people that agree with us! Adventure Lantern thanks Mr. Wiegele for taking the time to answer our questions. Judging from the information Mr. Wiegele provided, with the appropriate amount of funding, the fourth episode of Delaware St. John could provide a highly entertaining experience. Building on the storyline laid out in previous chapters, having additional financing would allow the development team to deliver a more robust and engaging adventure game. If you tried and enjoyed any of the previous games in the series, please consider contributing to the Delaware St. John Kickstarter project. To find out more about the project and make a pledge to contribute, please click here. Disclaimer: While I personally chose to make a donation to the project, Adventure Lantern has no financial interest in the Delaware St. John series or the upcoming fourth episode. This interview was solely posted to increase awareness about the fundraising effort. While I knew it was going to be against great odds to try and raise a decent budget to do the next Delaware game, I can admit I didn't anticipate a lot of the desires of the community. As a result, I've restructured the rewards for pledges to be more inviting for people who have not yet played any of the previous games and those who prefer a physical copy of a game. With a $50 pledge you will receive a digital copy of all three original games remastered (sharper graphics and video) as well as a special boxed disc version of "Asylum of The Lost". Also included is a digital copy of "Asylum of The Lost" and a digital copy of the soundtrack as well! I appreciate the support we've received so far but we definitely need more if we're going to make this happen! Please visit here and consider a donation.